Cops have arrested two men who had been sought in connection with separate robberies in and near the Loop. • Johnathan Rivera, 35, probably would not be in police custody if he could control his fervent anti-smoking beliefs. Rivera was in the Harold Washington Library around 3:30 p.m. on Dec. 5th when he asked another man not to smoke inside the building, according to a police report. He then took a cigarette from the 48-year-old smoker’s mouth, a fight broke out, and Rivera headbutted the smoker in the mouth—knocking out the man’s front tooth and causing a deep laceration to his own forehead, police said. During a police investigation of the smoking incident, officers learned that detectives had issued an “investigative alert” for Rivera in connection with a robbery in the New City neighborhood on July 4th. Rivera was arrested and has been charged with battery for allegedly headbutting the man in the library and felony robbery for allegedly robbing the other man of a watch and phone over the summer. The battery victim and Rivera were both treated at Northwestern Memorial Hospital for injuries they suffered in the headbutt. Judge Michael Clancy ordered Rivera held in lieu of $50,000 bail. 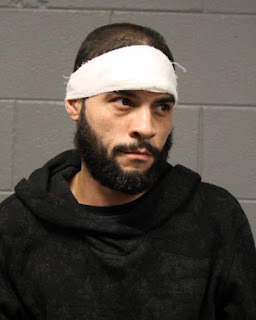 • A Rogers Park man has surrendered to police after investigators asked him to come in for questioning about his possible connection to a robbery that occurred near Grant Park on Nov. 25th. 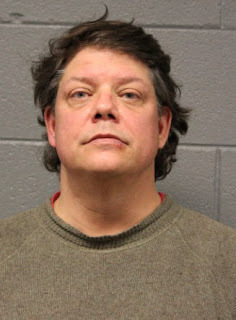 Police said the robbery victim identified Charles Jordan III, 49, as the man who struck him repeatedly and broke his left hand during the robbery in the 1100 block of South Michigan Ave. The victim, 33, told police he lost between $1,000 and $2,000 in the mugging. Jordan is charged with felony robbery. Judge John Lyke set his bail at $10,000.